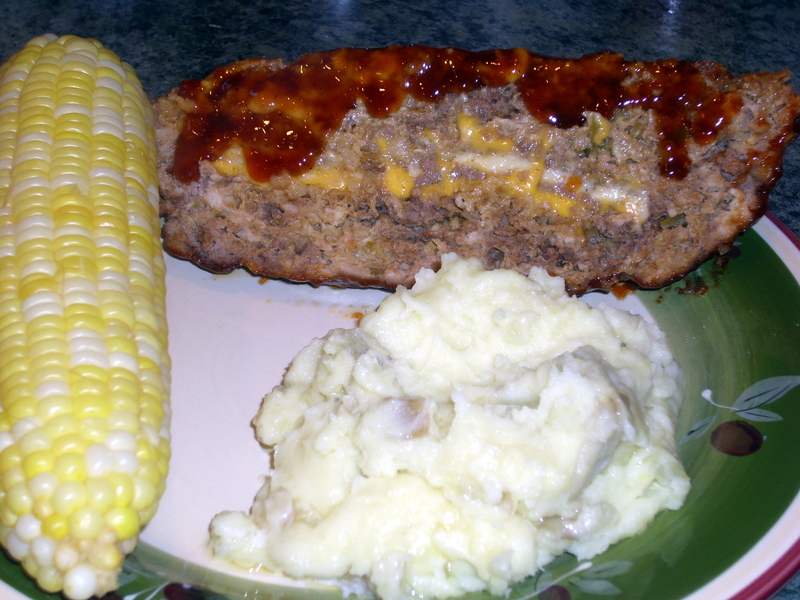 This entry was posted in Beef, Easy, Meatloaf, Pork by Janet. Bookmark the permalink. Janet, I love meatloaf and this stuffed meatloaf is absolutely delicious. Loved this recipe. Thanks for the share!! That’s a pretty cool meatloaf! I LOVE the movie….and remember that scene! It’s amazing how – based on your age – how you perceive it! Ain’t that the truth! When I first saw it many moons ago, I was in my mid teens and just thought it was funny. Now I see it from the parents point of view. Damn. I’m old. That is my husbands favorite holiday movie. I am not a fan, but I think that is because my brother loved and it we watched is pretty much daily through December every year. Love the face! If that doesn’t get my son to eat dinner, I don’t know what will! I was craving meat loaf the other day and now I want to make your recipe. Thanks for posting! I hope you like it Meagan! 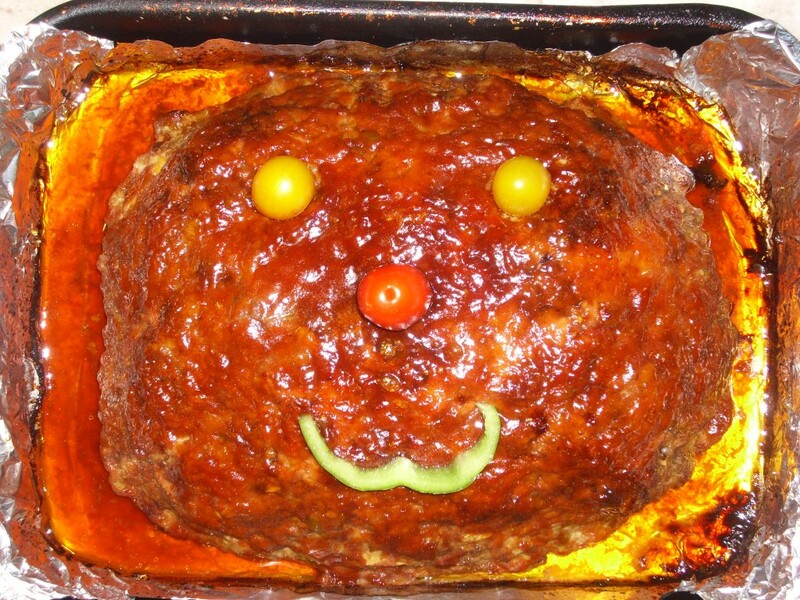 How cute is this meatloaf? I never thought I would use the word “cute” and meatloaf in the same sentence! And yes, I always think about A Christmas Story when I see a meatloaf. I l.o.v.e. meatloaf, this sounds so flavorful and comforting. I’m hungry for meatloaf now! I love meatloaf, but don’t make it often enough. I love “A Christmas Story”, but don’t watch it enough….This meatloaf sounds and looks tasty and scrumptious! Thank you for posting a meatloaf recipe that won’t just feed my 15 year old….Hubby and I may actually get a piece as well!! I love meatloaf. It is so yummy and brings back memories of childhood. And I love that movie. I laughed so hard at this post. I needed a good chuckle tonight so thank you for that and some delicious meatloafy goodness. Let me know what you think if you do, Peggy! Me too Kim. Also, love that movie. I force my kids to sit through it a gazillion times each Christmas lol. I’m glad I was able to give you a laugh when you needed it my friend. I’ve never really been a meatloaf fan….but I promise that I’ll try this one out! Hope you enjoy it and I can help change your mind about meatloaf Gen! I am always up for a good meatloaf recipe! The fact that it is smiling and that slice looks loaded with goodies has sold me. Thanks for the post, Janet and have a great day. I have to admit that I’m one of those that was raised on bland meatloaf and have had an aversion to it ever since. Lately, however, I’ve seen some amazing recipes (like this one) that have changed my mind a bit. Thanks for sharing this recipe. I can’t wait to give it a try. Hope you like it MC. Make sure you make the glaze for it. That’s what really takes it over the top. Made meatloaf last night! Although I didn’t play w/mine as well as you did…CUTE!! Wow this is a serious meatloaf! I’ll definitely be trying it out on the bf – his fave meal is meatload 🙂 thanks for sharing! Oh this sounds soooo tasty! Love this yummy idea!! I love this recipe… it sounds really flavorful!! thanks for sharing this. Oh my gosh you made an over 6 lb meatloaf. That’s awesome! Other than the fact it looks super tasty I’m still loving it for the size factor alone. The cheese in the middle? OMG a brilliant idea. Emily, stuffed meatloafs are awesome! OK! I’m convinced. I’m going to give it a try. I hope you like it Val! I move to the US in 1994 an did not know this movie but have come to love it. My favorite is FRAGILE it must be Italian.. abot the leg lamp..
Oh my goodness! I love it! btw, you’re hilarious. haha! I adore meatloaf! And your cheesy version looks delish! Eliot, Christmas Story rocks doesn’t it!? You had me at the chili cheese stuffed! I used to despise meatloaf, but as I’ve gotten older I’ve learned to love it. And I love that scene in a Christmas Story 🙂 That movie will be played on repeat before we know it! This looks delicious, love your little happy face! My kids are all adults but The Christmas Story is still a must on Christmas Day. My Mr. is a meatloaf aficionado and I think he would like this one. First time here….Wow…This looks delicious…Perfectly done dish…Bookmarking your blog now…Check out my blog too..